Dari sisi kualitas, kamera yang terpasang pada tablet saat ini sudah mencapai spesifikasi nilai fotografi. Pergerakan kamera (dari hypo, normal hingga hyper stereo) dapat dibuat otomatis atau auto-stereobase, sehingga fotografer 3D tidak perlu pusing lagi untuk memperhitungkan nilai stereo base setiap pemotretan. Dari penjelasan di atas memungkinkan candid foto 3D (mulai dari foto dekat atau close-up hingga foto aksi). Fotografer 3D cukup “mengarahkan dan bidik” kamera tablet dengan mudah karena semuanya otomatis termasuk nilai stereo base. Layar 3D lenticular pada layar tablet, sehingga tidak perlu kacamata 3D ketika melihat hasil foto 3D atau video 3D secara langsung. In terms of quality, the tablet’s camera today has reached the specification of photography values. 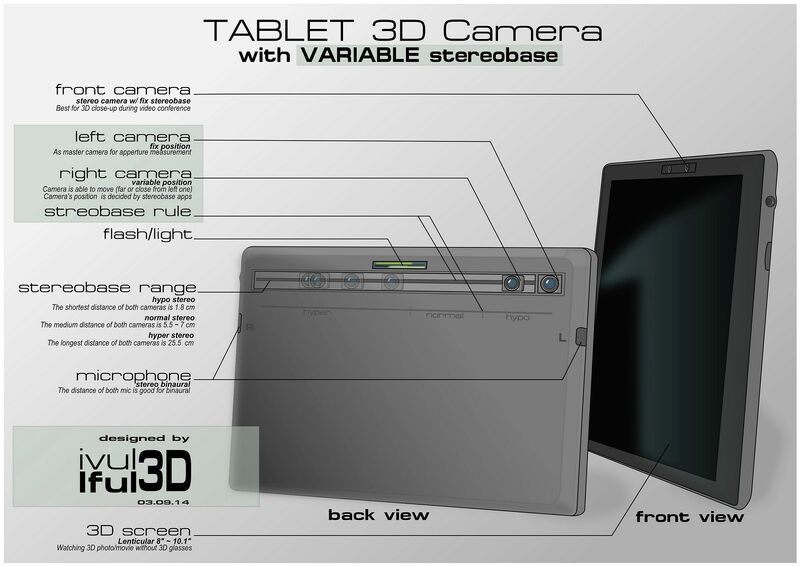 Wide range of stereo base is possible to be mounted on Tablet (from hypo to hyper stereo). The tablet’s camera are generally small and lightweight, making it one of the stereo cameras can be designed to move freely. Separating away from each other (hyper stereo, for long shot, limited landscape photographs) or moving closest each other (normal and hypo stereo, for medium shots and close-up). The very far of two cameras separated is depend on physical width of the tablet (tablet is in landscape position). The movement of the camera (from hypo stereo, normal stereo to the hyper stereo) can be made automatic or auto-stereobase, so the 3D photographer has no longer bother for calculating the stereo base of each 3D shoot. From the description above, 3D candid photos is quite possible and fun (from close-up photos to action photo). 3D Photographers just do “aim and shoot” because everything is automated including stereo base value. 3D lenticular screen on the tablet screen has been available today, therefore 3D glasses is not required to watch 3D photos or 3D video.